Serious students of Druidism and Paganism, as well as Celtic historians, are sure to include Barddas in their libraries. 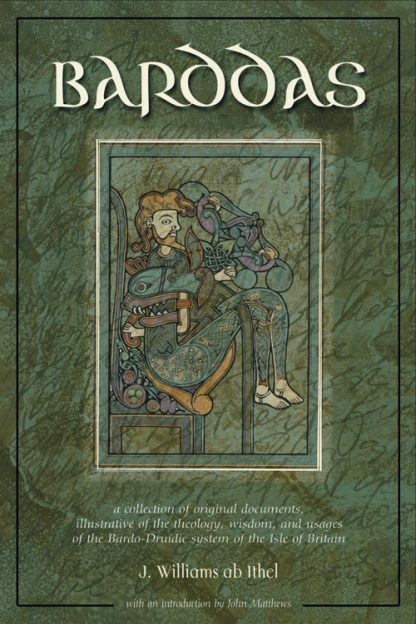 Barddas contains the only extant description of Bardo-Druidic Celtic philosophy. It is a metaphysical and spiritual description of beliefs handed down by word of mouth by Druidic initiates from before the Roman occupation of the British isles. Culled from 16th-century notes and compiled into book form, Barddas reveals a belief system with a wide range of influences, including Judeo-Christian and ancient Roman. Yet there are beliefs and views expressed within that appear to be unique to Celtic thought and oddly similar to Eastern traditions. On its publication in the 19th century, Barddas stirred controversy. Some critics claimed that it was completely made up or based on forgeries. Others defended it by pointing out similarities to other surviving Celtic documents with clear provenance. Photo-offset from the first printing, this edition of Barddas includes the original Welsh on verso pages with the English translation running on the recto pages. John Matthews, popular writer about all things Celtic, provides an introduction outlining the history and contemporary importance of Barddas.